Keegan Smith and the Fam will make their way from Portland, Ore., to play Whiskey Jacques’ on Thursday, Feb. 17. Boredom is out of the question for this weekend because there is plenty of live music from après-ski to a full music festival evening. Warm Springs Lodge entertainment starts today and will go through Sunday, Feb. 20, from 2-5 p.m. At River Run, après-ski music will be provided by Ethan Tucker on Friday, Feb. 18, and Sunday, Feb. 20, from 2-5 p.m. each day. A special visit from master trumpeter Lew Soloff from New York City will add to the Paul Tillotson Trio at the Duchin Lounge at the Sun Valley Resort from 4:30-8:30 p.m. through Saturday, Feb. 19. Soloff is a Grammy Award winner and was a founding member of Blood, Sweat & Tears. 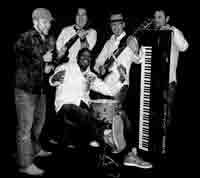 Other live music on Saturday, Feb. 19, includes Marley in the Mountains, Shamrocks and Dreadlocks, which will take place at 4 p.m. on the Simplot lot, future home of the Sun Valley Center for the Arts, across from the Ketchum Post Office. Tickets are $10, available at the concert and at all Atkinsons' Markets. The live music concert will feature Ethan Tucker and the Grass Roots All-Stars from 5-6:15 p.m., Carlos Jones and the Plus Band from 6:30-8:15 p.m. and Swagger, an Irish rock band, from 8:30-10 p.m. A Sunday Night Reggae Hall on Sunday, Feb. 20, at the Roosevelt Grille in Ketchum will start at 10 p.m. The free evening of music will feature Lions Den Sounds International Sound System with DJ Vision. More live music will take place throughout the valley, including Swagger at the Sun Valley Brewery in Hailey on Friday, Feb. 18, at 9 p.m. for $5 and DJ Marlene at the Silver Dollar in Bellevue on Friday, Feb. 18, at 9 p.m., which is free. At Whiskey Jacques' in Ketchum, enjoy several days of live music with the band Tracorum from San Francisco on Friday, Feb. 18. On Saturday, Feb. 19, Marmalade Hill will play. On Thursday, Feb. 17, Whiskey Jacques' will welcome Keegan Smith and the Fam from Portland, Ore.
"We play tons of diverse and different music," Smith said. "Members of the band play in several bands in Portland." Smith gave up a career in counseling when he realized he was making more money as a musician. "I hit the ground running when I decided to do it as a profession," he said. "I went to every open mic, and was playing six to seven nights a week. I landed gigs." Smith said his musician friends wondered how he was making a living. "I told them I asked to get paid," he said. Smith has a raspy but soft voice similar to Ben Harper's or Wycleaf Jean's. In addition, he listened to mostly hip-hop for a good part of his life, so he has a command of rhythm. "I developed a sound and recalled all the music I would hear," he said. "I listen to oldies radio stations so I have a Motown harmony." Combined with a song structure based on The Beatles' music, Smith's music schooling gave him an original sound, which he said is a folk, hip-hop, reggae funk. "I'm not a rapper," he said. "Whatever I deliver is making people come back and tell their friends. I just do what I do." Smith said his band is fantastic and allows him to do what he does. All shows at Whiskey Jacques' start at 10 p.m. with tickets available at the door. For a complete listing of music events in the valley, see the Music, Dance and Theater section of the Calendar on Page C5.